The private tent (NO tent provided) also has sea views!! Camping site rates are based per person, not per tent. You must bring your OWN tent! The double rooms at BASE are situated right on the rocks overlooking the ocean, you will not believe the view from your room!! BASE also has an onsite cafe open for breakfast, lunch and dinner daily with affordable and tasty food right at your doorstep. Whether your travelling, having a group party weekend or just need a few days in paradise..you need to stay at base!!! 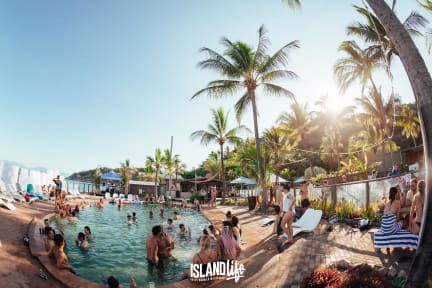 Island Life Beach Festival is a party unlike any other Australia has seen - igniting the steamy sands of Magnetic Island each month with the promise of peace + love + party for all! Paint yourself from head to toe, grab a bucket and let your body lose control at what has become Australia’s most iconic monthly outdoor party, Party with crowds of up to 5000!!!!!!! We absolutely LOVED our stay at Base Magnetic. The staff were unreal and went the extra mile to make sure we had the best time. Best showers we’ve had along the whole of the east coast. Drinks? Delicious. Food? Yummy. Beer? Cold. Music? FIRE. Would definitely give the green light to anyone who was thinking of staying here. Shoutout to Ellie who went above and beyond and took the day off to show us around the island. Big love and we miss you all already. The main thing about this hostel which makes it unique is it’s location metres away from the water. I was up every morning to see the sunrise because it was that easy. Hostel is very laid back and relaxed, it’s very quiet which is nice. One thing to note is to bring enough food from the mainland to save money. Kitchen is the only downside but other than that it’s a fantastic hostel and will be sure to come again. Staff are really friendly and the pool and common areas are amazing! However our room and the kitchen were pretty dirty, there were no utensils in the kitchen and the showers and toilets were a bit gross... could definitely be improved! Apart from that it was really great, good fun at the bar too. Staff is great! Location is good too so it‘s easy to get there by bus. Room and bed were clean. Kitchen is disgusting. Bar is way overpriced and you can’t bring your own alcohol. Wouldn’t stay again. Run down, toilets & showers dirty. Place just needs some tlc. Them keys on phone dont work at all because cant get any WiFi. Only nice thing is a loveliest view out to sea.